Without any hesitation, it can be said that Palawan is a very beautiful island; Even the international media approves to that! For many years, this island in the Philippines is always included in the most beautiful islands in the world, if not the number one. Rated based on travel attractions, activities, beauty, and overall experience, Palawan proves to be an island like no other. #1 - Stunning Beaches: Located between the West Philippine Sea and the Sulu Sea, the island of Palawan is surrounded by more than 50 pristine beaches. Even though tourism is very much flourishing in this island, the unspoiled beaches maintain its natural features. Island hop from the crystalline emerald blue waters of Honda Bay to the secluded beaches of Coron to the magnificent El Nido paradise to anywhere else in Palawan! Surely, you will never run out of beautiful choices. 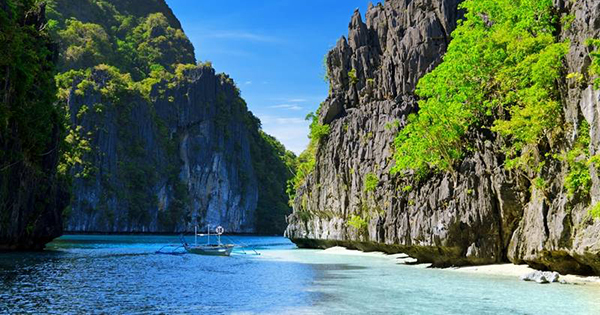 #2 - Amazing Lakes and Rivers: There are many lakes and rivers in the world, but Palawan has the most unparalleled ones. The Subterranean or Underground River in Puerto Princesa, Palawan, a UNESCO World Heritage Site and one of the New 7 Wonders of the World, is said to be the longest (8.2 km) and most amazing navigable underground river in the world. Kayangan Lake, nestled into the mountain walls, is as marvelous and is dubbed as one of the clearest lakes in the world. #3 - Majestic Limestone Cliffs: Another thing that makes Palawan really different from some equally beautiful islands is its towering limestone cliffs in El Nido and Coron. These cliffs made of Chinese jars, human teeth, and rocks from billion years ago is not just a sight to see. Many adventurous tourists take the challenge to climb it and do cliff diving. Taraw Cliff is one of the highest peaks on the island and climbing it rewards an amazing bird's eye view of the whole El Nido. #4 - Awesome Marine Life: But wait, there is more to Palawan's surface than meets the eye! The underwater sights of Palawan are considered the best coral reefs in the world. Diving in Tubbataha Reef Natural Park, a UNESCO World Heritage Site, there's a high chance of swimming with dolphins, sea turtles, even whale sharks! Coron Bay, moreover, has ten World War II shipwrecks of up to 40 meters underwater. Undeniably perfect for world-class snorkeling and diving experience! #5 - Wildlife Paradise: Aside from the rich underwater world, Palawan also has an abundant wildlife haven. A sanctuary for various animals, this island is a home to over 600 species of butterflies and many other endemic species such as peacock pheasant, pangolin, mouse-deer, etc. Experience wildlife in Arena Island, a home to thousands of turtles, Rasa Island, a dwelling place for birds, and Cleopatra's Needle, a habitat for 85% of Palawan's endemic animals. #6 - Mouthwatering Seafood: After feasting your eyes on such wonderful creation, literally have a feast with freshly caught local fishes and seafood. Go around the public market and get acquainted with the variety of fresh fishes and seafood that's waiting to be cooked. Several hotels and restaurants also offer sumptuous seafood dishes cooked in ways that would certainly tickle your taste buds. #7 - Friendly Local People: What's more beautiful than Palawan but the people in it! It was even voted by the readers of the New York-based magazine Travel + Leisure as the world's friendliest island. Add the very welcoming locals to the scenic beauty of Palawan and you get the ultimate holiday relaxation.